Liverpool to offload Fabinho to sanction Pulisic move? Liverpool could reportedly seek to cash in on the services of Fabinho in the New Year in order to fund a potential move for Borussia Dortmund's Christian Pulisic. Fabinho joined the Reds from AS Monaco during the summer but he has since taken time to adjust to the club's style of play with just three league starts to his name. 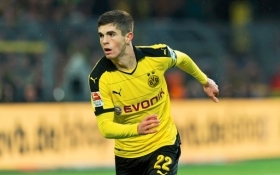 Amidst this, there has been constant speculation regarding his future and The Mirror suggests that the Reds could consider parting ways with the midfielder in order to finance a winter deal for Pulisic. Pulisic has been a long-term target for the Reds and reports have recently indicated that Dortmund could sanction the attacker's sale this winter with around 19 months remaining on his existing deal. Chelsea have already been fancied to make a bid worth £70m for the United States international but they could be rivalled by the Reds, who are likely to come up with a similar offer on the table.